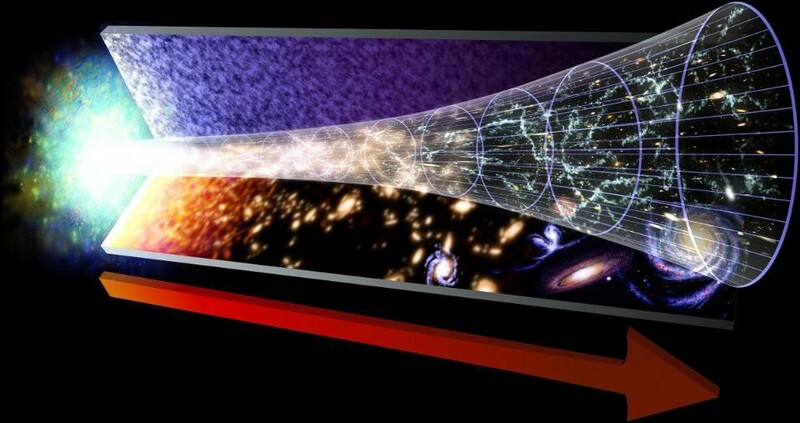 The history of the Universe and the arrow of time. Image credit: NASA / GSFC. Where does our arrow of time come from? The past is gone, the future not yet here, only the present is now. But why does it always flow the way it does for us? Every moment that passes finds us traveling from the past to the present and into the future, with time always flowing in the same direction. At no point does it ever appear to either stand still or reverse; the “arrow of time” always points forwards for us. But if we look at the laws of physics — from Newton to Einstein, from Maxwell to Bohr, from Dirac to Feynman — they appear to be time-symmetric. In other words, the equations that govern reality don’t have a preference for which way time flows. The solutions that describe the behavior of any system obeying the laws of physics, as we understand them, are just as valid for time flowing into the past as they are for time flowing into the future. Yet we know from experience that time only flows one way: forwards. So where does the arrow of time come from? A ball in mid-bounce has its past and future trajectories determined by the laws of physics, but time will only flow into the future for us. Image credit: Wikimedia commons users MichaelMaggs and (edited by) Richard Bartz, under a c.c.a.-s.a.-3.0 license. Many people believe there might be a connection between the arrow of time and a quantity called entropy. While most people normally equate “disorder” with entropy, that’s a pretty lazy description that also isn’t particularly accurate. Instead, think about entropy as a measure of how much thermal (heat) energy could possibly be turned into useful, mechanical work. If you have a lot of this energy capable of potentially doing work, you have a low-entropy system, whereas if you have very little, you have a high-entropy system. The second law of thermodynamics is a very important relation in physics, and it states that the entropy of a closed (self-contained) system can only increase or stay the same over time; it can never go down. In other words, over time, the entropy of the entire Universe must increase. It’s the only law of physics that appears to have a preferred direction for time. Still from a lecture on entropy by Clarissa Sorensen-Unruh. Image credit: C. Sorensen-Unruh of YouTube, via https://www.youtube.com/watch?v=Mz8IM7pWkok. So, does that mean that we only experience time the way we do because of the second law of thermodynamics? That there’s a fundamentally deep connection between the arrow of time and entropy? Some physicists think so, and it’s certainly a possibility. In an interesting collaboration between the MinutePhysics YouTube channel and physicist Sean Carroll, author of The Big Picture, From Eternity To Here and an entropy/time’s arrow fan, they attempt to answer the question of why time doesn’t flow backwards. Unsurprisingly, they point the finger squarely at entropy. It’s true that entropy does explain the arrow of time for a number of phenomena, including why coffee and milk mix but don’t unmix, why ice melts into a warm drink but never spontaneously arises along with a warm beverage from a cool drink, and why a cooked scrambled egg never resolves back into an uncooked, separated albumen and yolk. In all of these cases, an initially lower-entropy state (with more available, capable-of-doing-work energy) has moved into a higher-entropy (and lower available energy) state as time has moved forwards. There are plenty of examples of this in nature, including of a room filled with molecules: one side full of cold, slow-moving molecules and the other full of hot, fast-moving ones. Simply give it time, and the room will be fully mixed with intermediate-energy particles, representing a large increase in entropy and an irreversible reaction. A system set up in the initial conditions on the left and let to evolve will become the system on the right spontaneously, gaining entropy in the process. Image credit: Wikimedia Commons users Htkym and Dhollm, under a c.c.-by-2.5 license. Except, it isn’t irreversible completely. You see, there’s a caveat that most people forget when it comes to the second law of thermodynamics and entropy increase: it only refers to the entropy of a closed system, or a system where no external energy or changes in entropy are added or taken away. A way to reverse this reaction was first thought up by the great physicist James Clerk Maxwell way back in the 1870s: simply have an external entity that opens a divide between the two sides of the room when it allows the “cold” molecules to flow onto one side and the “hot” molecules to flow onto the other. This idea became known as Maxwell’s demon, and it enables you to decrease the entropy of the system after all! A representation of Maxwell’s demon, which can sort particles according to their energy on either side of a box. Image credit: Wikimedia Commons user Htkym, under a c.c.a.-s.a.-3.0 license. You can’t actually violate the second law of thermodynamics by doing this, of course. The catch is that the demon must spend a tremendous amount of energy to segregate the particles like this. The system, under the influence of the demon, is an open system; if you include the entropy of the demon itself in the total system of particles, you’ll find that the total entropy does, in fact, increase overall. But here’s the kicker: even if you lived in the box and failed to detect the existence of the demon — in other words, if all you did was live in a pocket of the Universe that saw its entropy decrease — time would still run forward for you. The thermodynamic arrow of time does not determine the direction in which we perceive time’s passage. So where does the arrow of time that correlates with our perception come from? We don’t know. What we do know, however, is that the thermodynamic arrow of time isn’t it. Our measurements of entropy in the Universe know of only one possible tremendous decrease in all of cosmic history: the end of cosmic inflation and its transition to the hot Big Bang. We know our Universe is headed to a cold, empty fate after all the stars burn out, after all the black holes decay, after dark energy drives the unbound galaxies apart from one another and gravitational interactions kick out the last remaining bound planetary and stellar remnants. This thermodynamic state of maximal entropy is known as the “heat death” of the Universe. Oddly enough, the state from which our Universe arose — the state of cosmic inflation — has exactly the same properties, only with a much larger expansion rate during the inflationary epoch than our current, dark energy-dominated epoch will lead to. The quantum nature of inflation means that it ends in some “pockets” of the Universe and continues in others, but we do not yet understand either what the amount of entropy was during inflation or how it gave rise to the low-entropy state at the start of the hot Big Bang. Image credit: E. Siegel, from the book Beyond The Galaxy. How did inflation come to an end? How did the vacuum energy of the Universe, the energy inherent to empty space itself, get converted into a thermally hot bath of particles, antiparticles and radiation? And did the Universe go from an incredibly high-entropy state during cosmic inflation to a lower-entropy one during the hot Big Bang, or was the entropy during inflation even lower due to the eventual capacity of the Universe to do mechanical work? At this point, we have only theories to guide us; the experimental or observational signatures that would tell us the answers to these questions have not been uncovered. From the end of inflation and the start of the hot Big Bang, entropy always increases up through the present day. Image credit: E. Siegel, with images derived from ESA/Planck and the DoE/NASA/ NSF interagency task force on CMB research. From his book, Beyond The Galaxy. We do understand the arrow of time from a thermodynamic perspective, and that’s an incredibly valuable and interesting piece of knowledge. But if you want to know why yesterday is in the immutable past, tomorrow will arrive in a day and the present is what you’re living right now, thermodynamics won’t give you the answer. Nobody, in fact, understands what will.